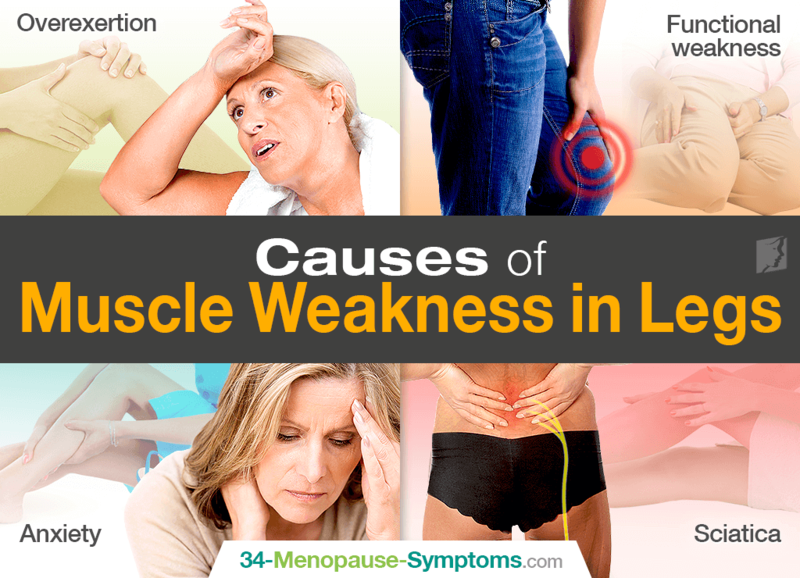 It is fairly common for menopausal women to notice that their legs feel weak on some occasions. There could be a number of different reasons behind this condition, and depending on the cause of your leg weakness, there is a range of ways it can be treated or at least managed. Most often, a weak feeling in the legs is temporary, but if you are concerned about the frequency or severity of weakness you are experiencing, keep reading this article to find out the potential reasons and treatments for muscle weakness. It is possible to experience leg weakness to varying degrees, and it can occur either suddenly or gradually. Many women describe a general fatigue sensation when they stand or walk, which can be puzzling if they are merely carrying out a mundane task and have not been doing any strenuous activity. When leg weakness presents itself in conjunction with pain, it can be particularly troubling. It might be an overall aching feeling, though sharp pain is also possible depending on your individual circumstance. As women get older, their bodies become less capable of carrying out the same level of activity as once was possible. Taking that hour-long walk might not be as easy anymore, and you may find that the following day - or indeed days - your leg muscles feel substantially weak. This disorder is somewhat uncommon, and can be difficult for doctors to diagnose. It describes a temporarily malfunctioning nervous system, and can usually be cured. It can be caused by physical or psychological factors, and entails a weakness of limbs that occurs because of a problem surrounding the messages between your brain and the peripheral nervous system. Some women who struggle with mental health find that they are physically affected. During particularly stressful occasions, they might be faced with a sudden weakness of the legs, which many describe as akin to a “jelly” or “rubber” feeling. Unfortunately, this condition is considerably common in women aged between 40 and 50. It is caused by a slipped disc in your back - the chances of which become higher as you lose flexibility with age. With sciatica, many women experience pain, a tingling sensation, and loss of strength in their lower legs and ankles. If your legs feel weak after you know you have carried out an unusual degree of physical activity, the most beneficial coping technique is to ensure your legs get sufficient rest. You should stretch your legs regularly, but avoid further strenuous exercise. To avoid muscle weakness in legs caused by distress and anxiety, it is suggested that you practice meditation in order to help you become better equipped to deal with stressful occasions. When leg muscle weakness is caused by a condition such as sciatica, moderate exercise and stretches are extremely valuable. A physical therapist can guide you through motions and exercises that will correct the problem without causing additional injury. While feeling weak in the legs can be debilitating and frustrating, it is helpful to maintain a positive frame of mind and consider some of the causes and treatments. Exploring these should help you to better understand your condition and enable you to reach at least one, if not more, worthwhile ways to manage or treat it. Leg muscle tension can be a mild, but constant, nuisance as menopause approaches. However, don't let it become an obstacle for your new healthy lifestyle.